The wholesale price of 1 epinephrine autoinjector increased annually from $35.59 in 1986 to $87.92 in 2011 (147%). Among patients prescribed autoinjectors, only 40% of teens/adults and 60% of children less than 12 years of age had them refilled over a 6-year period. The retail price of the new "EpiPen 2-pak" that the patients often quote is more than $250 for each "pak". In August 2012, the FDA approved Auvi-Q - the first-and-only epinephrine autoinjector with audio and visual cues that guide patients and caregivers step-by-step through the injection process. No information about the price of Auvi-Q is available at this time but it is not expected to cost significantly less than EpiPen. There are lower-cost alternatives to epinephrine autoinjectors. Recently, three allergists from the University of South Florida suggested in JACI thar prefilled epinephrine syringes made in a clinic can be safely provided to patients who cannot afford prescription autoinjectors. 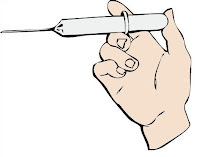 Prefilled syringes are stable and sterile for 2 months in dry climates and 3 months in humid climates. Parents take 140 seconds to withdraw epinephrine from an ampule into a syringe, therefore a prefilled syringe is recommended. Volume 130, Issue 3 , Pages 822-823, September 2012. Allergic Living @AllergicLiving: That's my point, should they be "encouraged' to return as an additional option, perhaps by AAAAI? Craig, CEN, CCRN @CraigCCRNCEN: My ANA kit with Benadryl also is cheaper and less painful to administer. The cost of this should be around $10-$20.